General Information: The Manzano chile, originally from South America, is one of the few chiles that are cultivated in Mexico that are not included in the Capsicum annuum species. It is part of the Capsicum pubescens species from the Andes region. Its name of "Manzano", meaning apple, it has others such as Chile Peron, Chile Caballo and Chile Ciruelo. It is very resistant to low temperatures and is commonly grown at high altitudes. The states of Mexico; Queretaro, Chiapas and Guerrero, in their high elevations produce it in a limited form and for local consumption. It grows in a large shrub, sometimes as a creeper and reaches about 3 meters. Its fruit is spherical and measures from 3 to 5 cm. in diameter. It turns yellow-orange when ripe. Also known as the rocoto pepper is measures 50,000 - 100,000 units on the Scoville heat scale making it a very hot pepper. This chile is typically found in South America. It is among the oldest of domesticated peppers, and was grown up to as much as 5000 years ago. 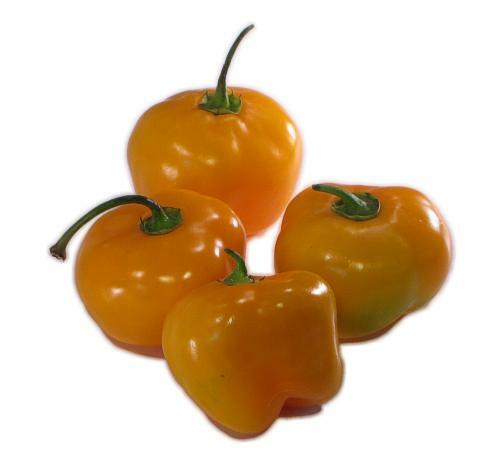 Applications: Manzano chile peppers are relatives of the super hot habanero peppers. Manzanos are used most often in fresh form because the pods are so thick they are difficult to dry. They are great for making hot salsas. The manzano is unusual in that it has black seeds.